Georges is a Unix (commercial or free) long time user . 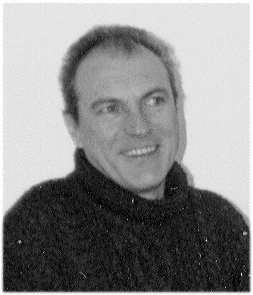 He works among ten or so OSes, where he is in charge of network administration, application development, system operations... Just for a pleasant change, he spends some of his spare time looking after his two old computers (an Amiga and a NeXT station) and participating in free software projects. Another window manager you say. Right, but this one is unusual. 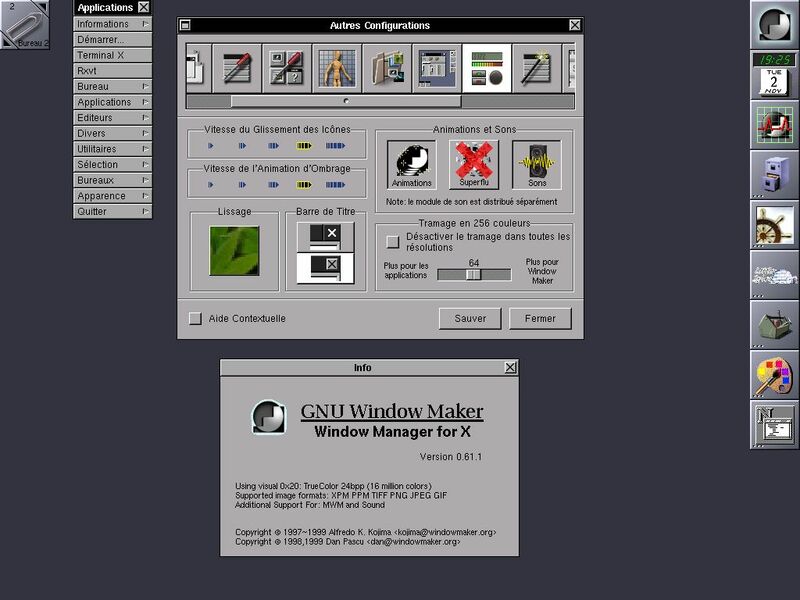 If you have had enough of Windows substitutes, Window Maker is for you. In the Linux world, there is a surprising phenomenon: "Windows inspiration". The basic window managers, fvwm and its derivatives are typical of this. 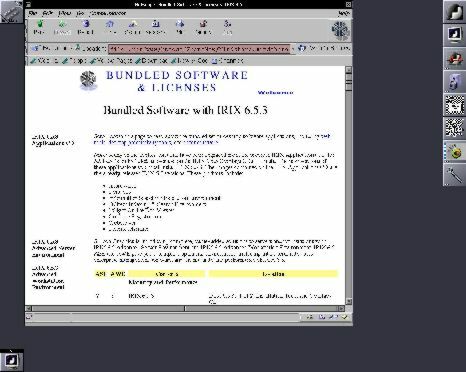 For desktop environments, it is almost worse: KDE is a mixture of Windows and CDE. 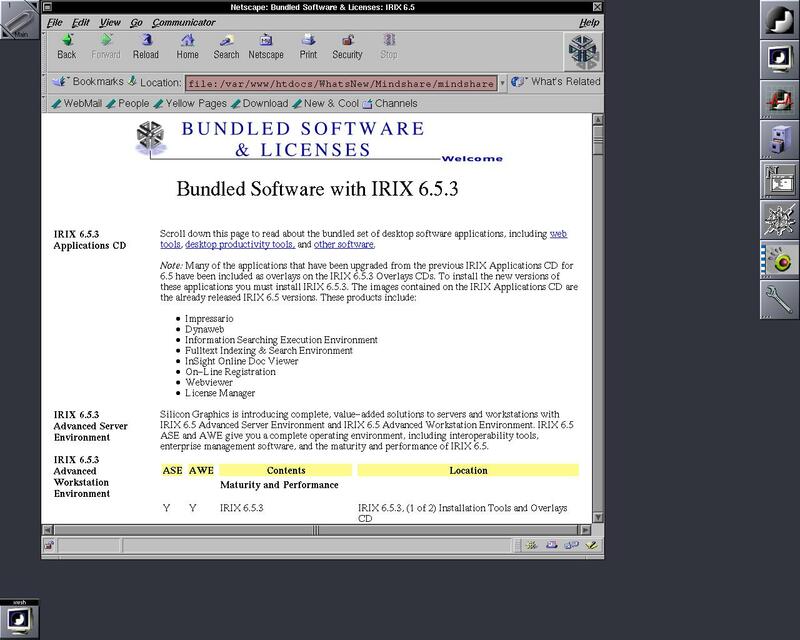 (CDE: probably the winner of the buggiest software in the commercial Unix world! Especially, under Solaris 2.6, where they even forgot to code some menu items, among many others funny things.) GNOME, though more original than KDE, follows the same track. Doubtless, this characteristic has helped to attract a number of Windows users to Linux. This is not to say that I have anything against these environments. They often provide us with very interesting tools. Window Maker is the work of Alfredo Kojima with the help of Dan Pascu and Matt Hawkins. Many other people have been participating in the project and we can't name them all. The main point about WM really is its appearance. The happy people knowing NeXTStep will find more than similarities. WM is the exact replica of the NeXT GUI. Its philosophy is particular too, and requires some curiosity and an ability to forget the old habits. We will get back to that later. You will find WM at http://www.Window Maker.org You must download libPropList from the same site and compile it before WM. If you have a previous version of this library, throw it away! You can download Window Maker-extra-0.*. * if you want more icons or themes. You will need the corresponding libraries to be able to compile with jpeg, tiff, etc. support. READ the README and INSTALL files before compiling, it will save you some bother later. In particular, it will inform you about necessary packages and their version. For example, you will not be able to install WM without lex and yacc (or flex and bison as a replacement for both). Consider installing xgettext if it is not part of your Linux distribution (or other OS). RedHat users wishing to install a new version of WM will have to remove the RPM provided with the distribution. Same for SuSE. WM can be installed on any Unix platform (and Linux is Unix, we don't say it enough), but with some particularities. If you use Linux, run ldconfig after installing, as soon as the library path is present in /etc/ld.so.conf. Those not using Linux will have to use the LD_LIBRARY_PATH variable to set the path. Everything is installed in /usr/local by default. Of course, this must be in your path. On some OSes, /usr/local/bin must be the first item of the path. Same for libraries: /usr/local/lib will have to be first with an OS such as Solaris. If you cannot su root, different instructions are given in the above-mentioned files. And the best for last: if you don't like compiling, WM can be found as RPM, DEB, etc. packages. After compiling and installing, run the wmaker.inst program. It will create all needed directories and subdirectories and a start file like .xinitrc or .xsession in your home directory. If you followed the directions, the next time you run startx you will be within WM. If you use xdm or the like to launch your X session, it is a little more complicated. Now you can start customizing your GUI. The WPrefs program will manage your preferences automatically. The parallel between WM and NeXT shows its flavour: It's the same! The operating mode is not only user-friendly but obvious. Balloon help can be used if necessary. It's up to you to discover how. THE particularity of WM inherited from NeXT is the dock. The dock is this column of icons aligned on the right part of your screen. Each icon is used to launch the corresponding application by double-clicking on it. How to dock an application? Up to you, it's part of discovery pleasure! You prefer menus? You can fully specify them in different ways, more or less sophisticated. Yours to discover as well. All this can be localized in the language of your choice, of course. Last but not least, the clip. The clip is the icon on the top left of your screen. This object has an interesting set of features. Among others, it can be a substitute for the pager. A well known problem under Linux, on account of the wide variety of hardware configurations, is the display. Obviously, it depends on your graphics card. If your card allows 24-bit display, the following is of no interest to you. If it only allows 8-bit display, that's a different story. You will have to compromise between the resolution and the number of colors dedicated to WM. Within WPrefs, the default settings for 8-bit display are good. Keep them! (Well, there's nothing to stop you from playing with them.) For resolution, the higher the better. Make up your mind with the screenshots below. To save resources, avoid themes or background pictures and use a plain color background. Test different settings but remember: it's always a compromise. The applications available for Linux and other free Unix work fine with WM, of course. However, specific applications are available as well. They can be either small dockable utilities, or bigger applications with the NeXT appearance. The mailer, postilion, is an exact replica of the NeXT mailer and FSViewer is a file manager along the same lines. There are so many apps, we can't possibly name them all. 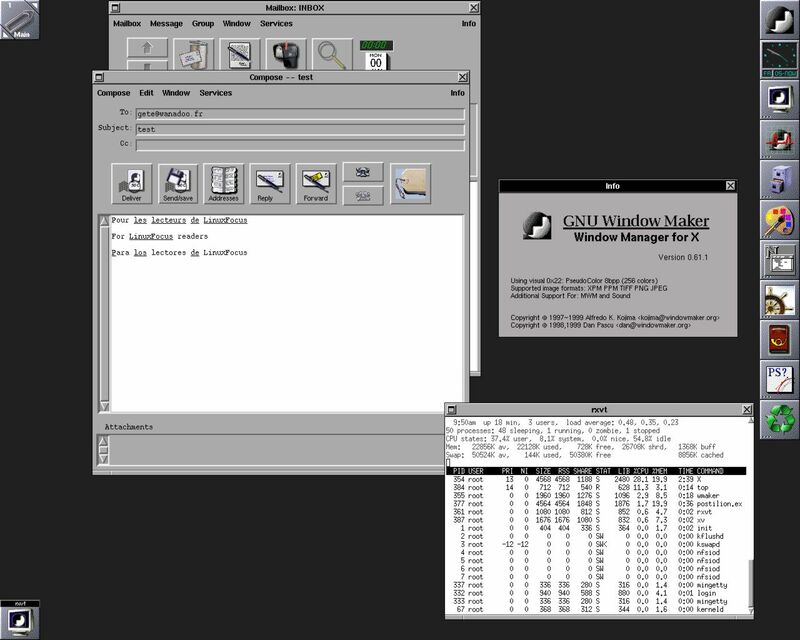 Window Maker is part of the GNUStep project, a port of OpenStep to a maximum of platforms. OpenStep, based on Objective C, is the reference environment for object development. 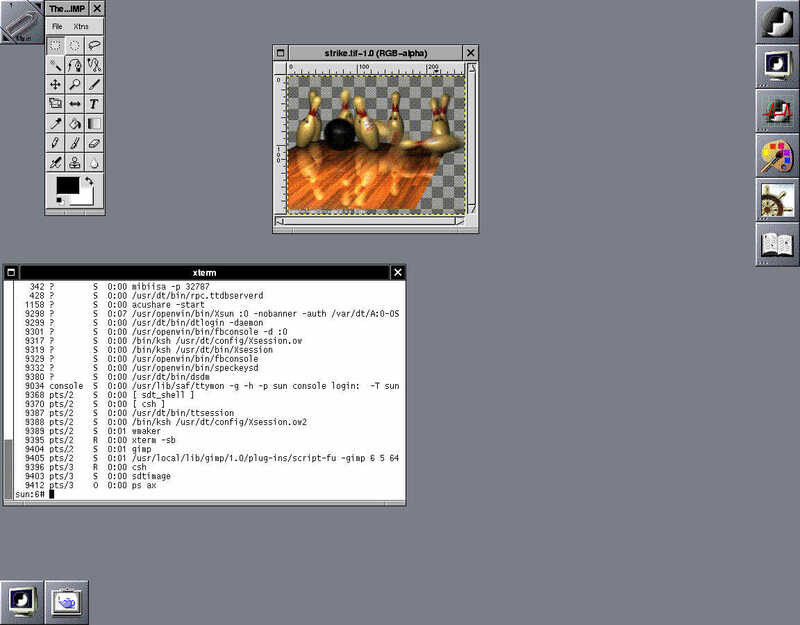 Unfortunately, OpenStep is also the beginning of the end for NeXT. 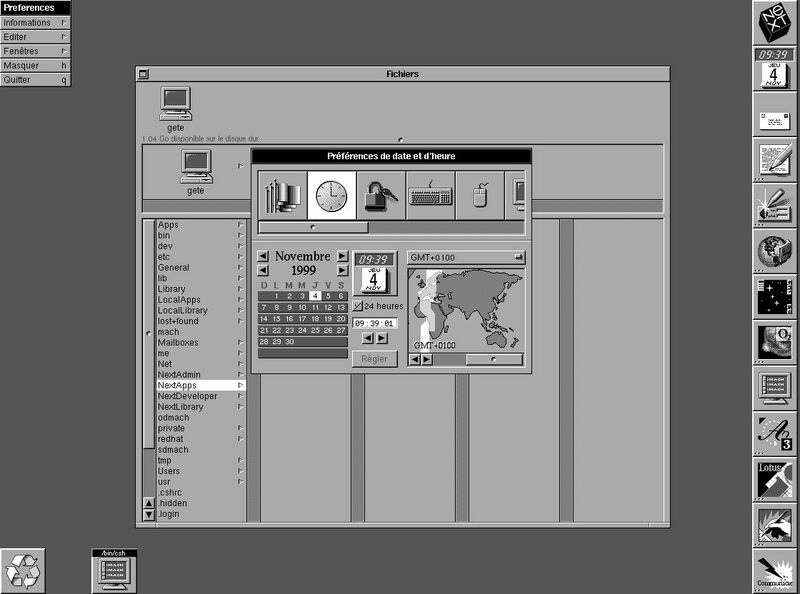 OpenStep was about "transplanting" NeXTStep on top of another OS (Solaris, Not Terminated...) The accent was placed on development since, let we forget, Interface Builder, the fantastic NeXT tool box, is the "father" of all the tool boxes we know today. In my humble opinion, nothing has equalled it since. Paradoxically, this machine and this OS so revolutionary have been unable to capture a big part of the market. This last attempt from NeXT was a commercial setback like everything else before. NeXTStep was targeted to the personal computer market rather than to workstations. It was priced too high, and eventually NeXT ceased its activities only to be bought out by Apple. Gag? NeXT was created by Apple co-founder, Steve Jobs! Why this small review? Because ten years later, NeXT is back in different forms. A big part of the free software world releases projects based on NeXT appearance. GNUStep is the most significant example. Go and visit http://www.gnustep.org. At last, Apple is releasing a multitasking OS, MAC OS X, which is just NeXTStep with home dressing. After having been first rejected and then stolen (I have names, but just have a look at screenshots to realize), many people notice that NeXT is not getting old. That just shows how ahead of its time it was on first release in 1987! This sytem was based on a very compact Mach kernel underneath Unix BSD 4.2 at the beginning and 4.3 a bit later. You may like it or hate it, but you won't stay indifferent. So if you feel affinities with this great product, Window Maker is a first step into the brotherhood. Afterwards, nothing will stop you from participating in the rest of the project. WM is at version 0.61.1. It is very stable, doesn't use many resources and is evolving quite fast. Its direction could change a bit since it may be integrated into the GNOME project. Perhaps then we would move towards two different products: the present one and a GNOME integrated one. Wait and see! In conclusion, if you feel like using a GUI with nothing to do with the "products" of a Redmond megalomaniac, jump into Window Maker and enjoy!